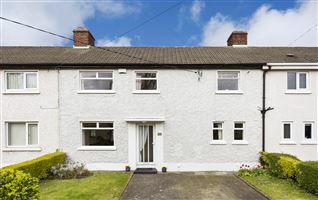 REA Grimes and Savills proudly present 11 Tresilian to the market. Midweek private viewings by appointment only. 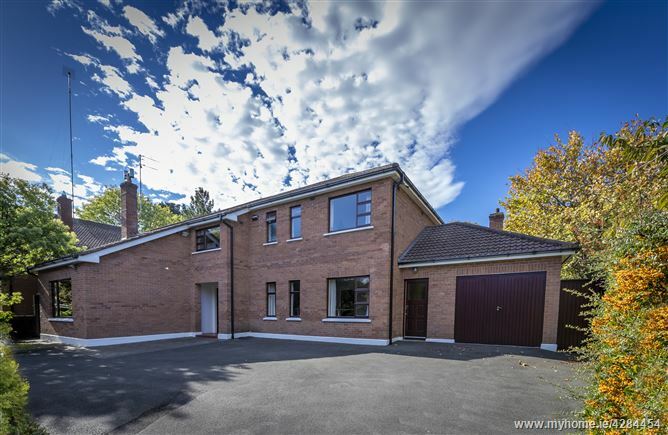 An exquisite family residence in an incredible secure and private location within walking distance of Foxrock Village and all the amenities that this exclusive area has to offer. Testament to this exclusivity is the fact that No. 11 is the first house to come to the market in 17 years. 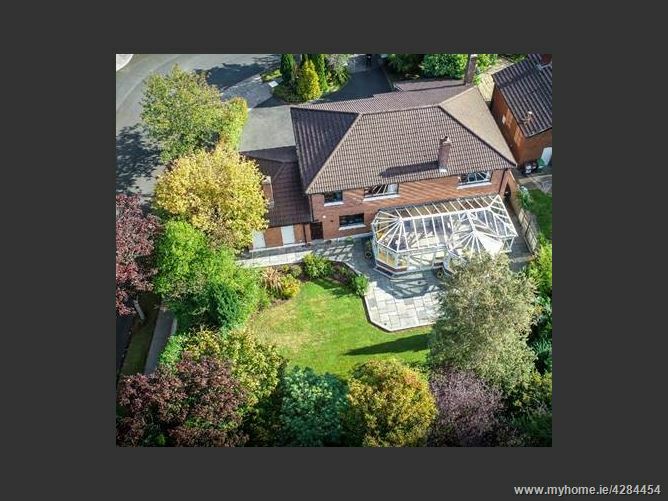 This fine, detached, five bedroom home offers superb and spacious, well presented accommodation over two expertly planned floors that will emphasise a balanced tone of comfort and functionality eminently suitable for family living on a large secure private south westerly site. No. 11 is approached via a covered porch from a large front drive way with ample off-street parking. Beautifully apportioned rooms throughout the interior are flooded with natural light from extensive windows. 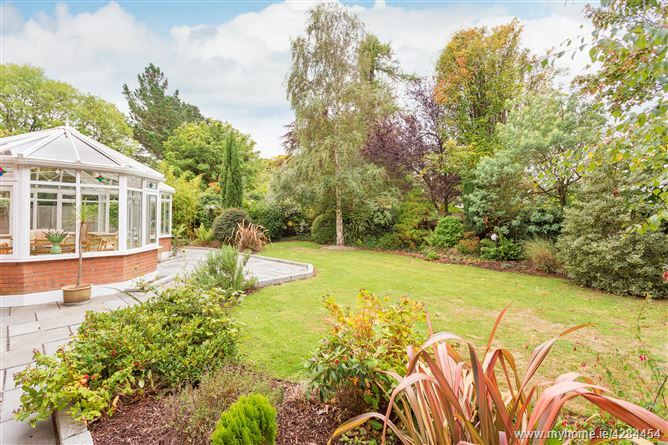 The exterior enjoys the pleasant advantage of a double size conservatory / sun room to the rear and a refreshing south westerly rear garden aspect. 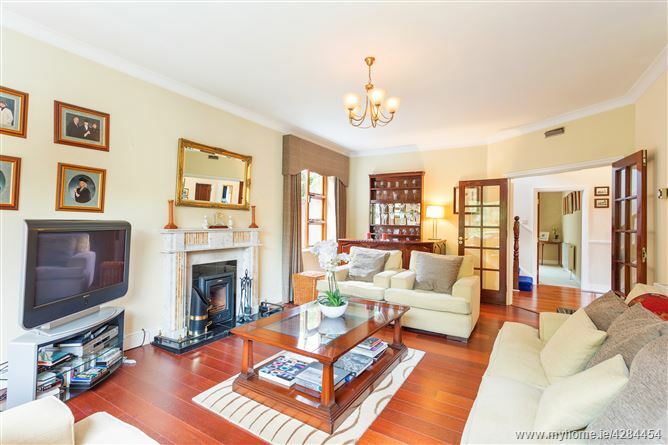 There are two front reception rooms on either side of the entrance hall, the left with a feature cassette fireplace with marble surround and an entertainment area. 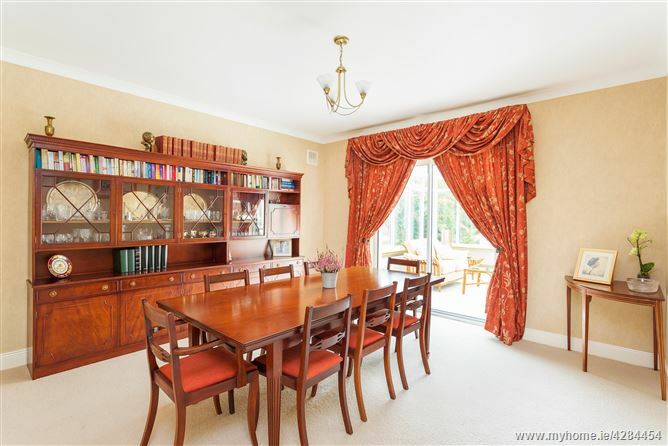 A formal dining room to the rear, leads into the conservatory / sun room through double glass sliding doors which in turn allow guests bright and enjoyable views. 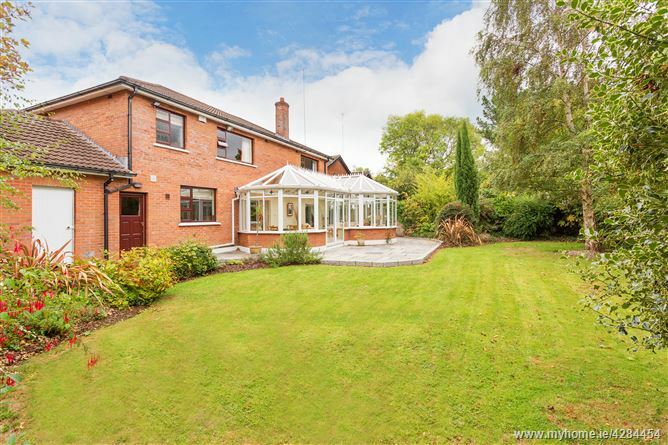 A large, rear, open plan kitchen also lit up by the favourable garden aspect and its outlook has its own access to the sun room through glass sliding doors. A kitchen island breakfast bar and a secondary, separate dining area as well as granite work tops make portray a smart and welcoming kitchen and heart of the home. 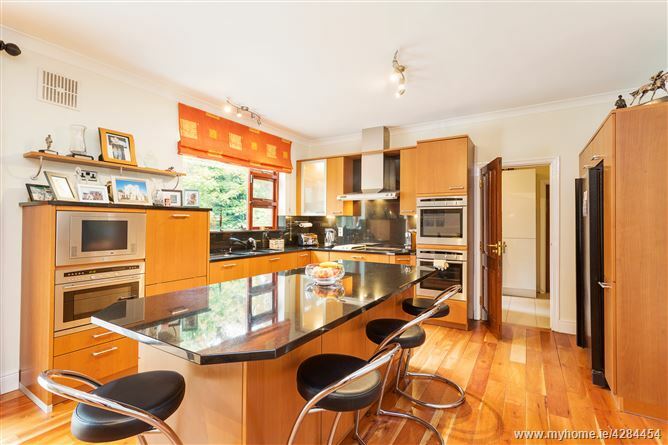 From the kitchen is access to a fully fitted utility / pantry room with installed storage and space for laundry appliances and further access to the garden and garage as well as a second entrance. The conservatory / sun room is breathtakingly bright and splendid in size. 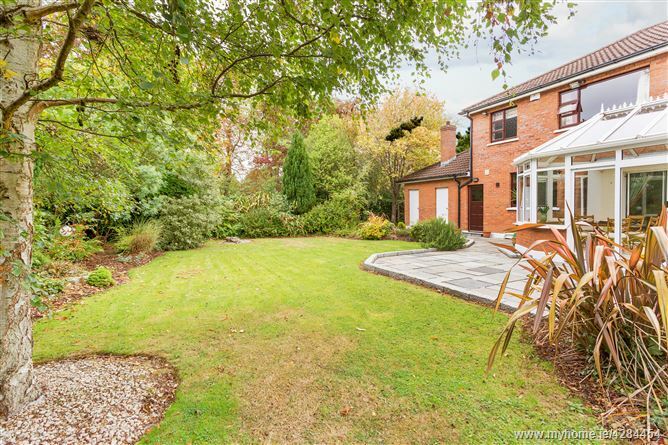 Two seating areas and separate dining area overlook a partly paved, lawned and landscaped rear garden. 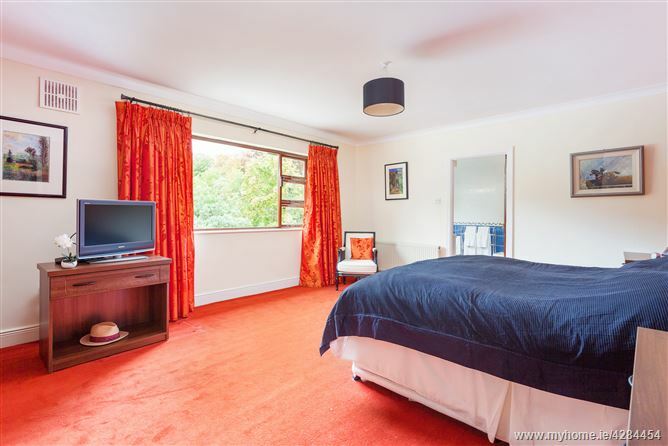 The first floor features five bedrooms, master en suite, hot press and family bathroom. 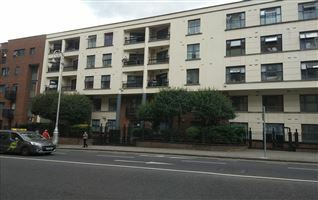 Three of the bedrooms are very well apportioned doubles and two could be used as small doubles or spacious singles. 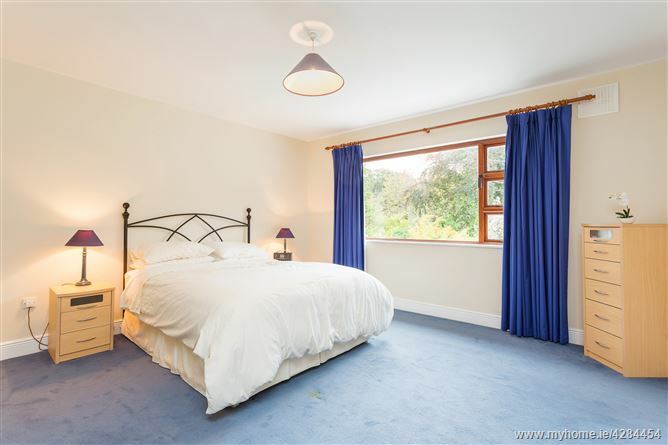 Generous built in wardrobe space is seen throughout the bedrooms as well as bright airy accommodation. There are a wonderful range of fine eateries, speciality shops, and boutiques along with a number of reputable pre-schools, primary and secondary schools also within close proximity of Foxrock Village. 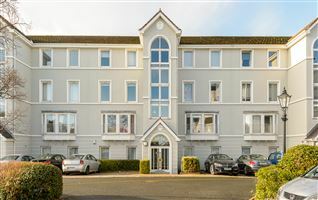 Carrickmines and Foxrock Golf Clubs, Cabinteely park, Carrickmines Tennis Club, Leopardstown Racecourse together with Westwood Health and Fitness Centre are just a short drive away. 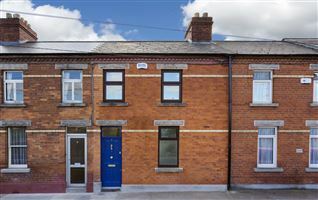 Excellent transport facilities are within easy reach including the LUAS, N11 and M50. 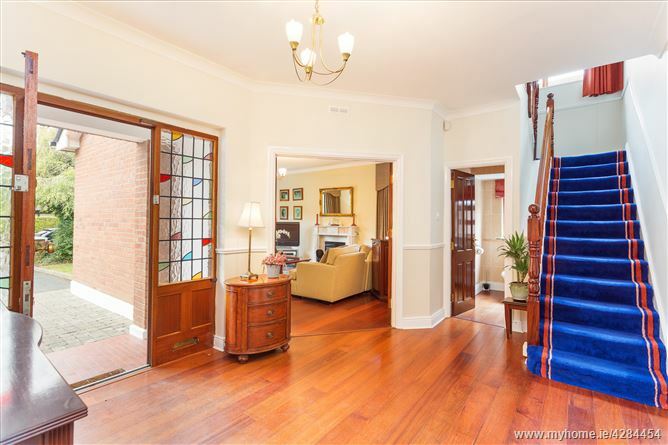 Entrance Hall Stained glass panels on either side of front door allow light into the area, wood flooring, pendant chandelier style light fitting. 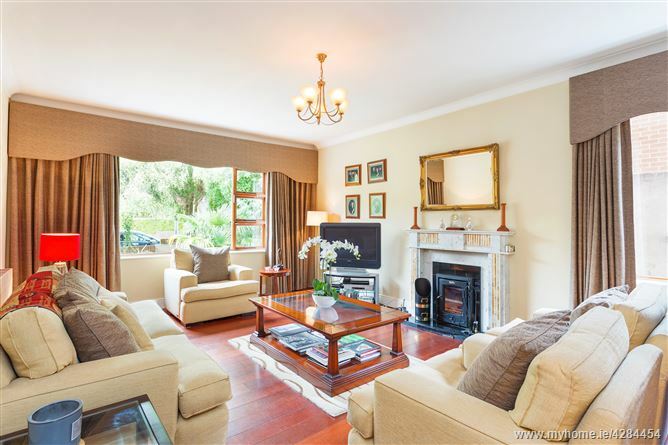 Front Reception Room Accessed through glass panelled double doors, feature cassette fire place with marble surround, large window to front overlooking front lawn. Porch / Boot room Tiled floor, glass panelled external door. Utility / Pantry Room Tiled floors and partial walls. High gloss storage attached to wall, wood style work top with recessed stainless steel sink and draining area. Access to garden from rear and to garage. 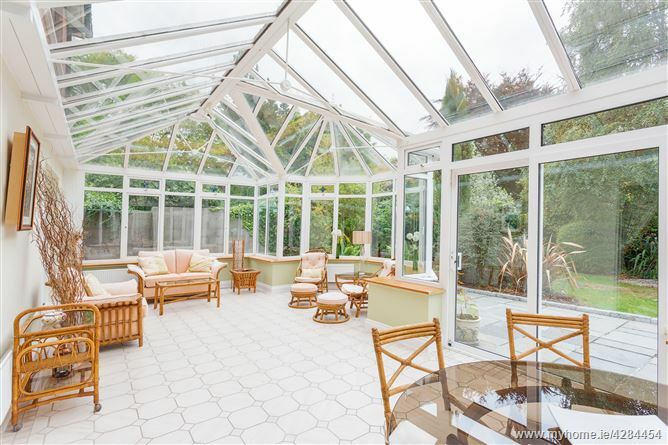 Conservatory / Sun Room Fantastic open plan space over looking garden with double glazed windows to front and sides as well as roof. Sliding double doors leading out onto garden, two seating areas, one dining area, tiled floor. 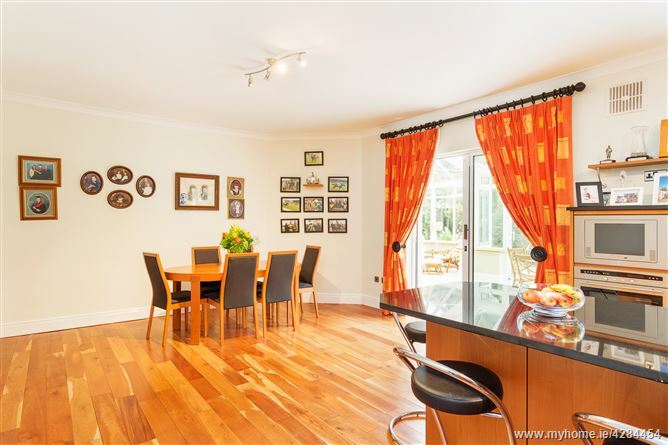 Family Reception Room Wood flooring, fitted down lighter, two large windows to front. 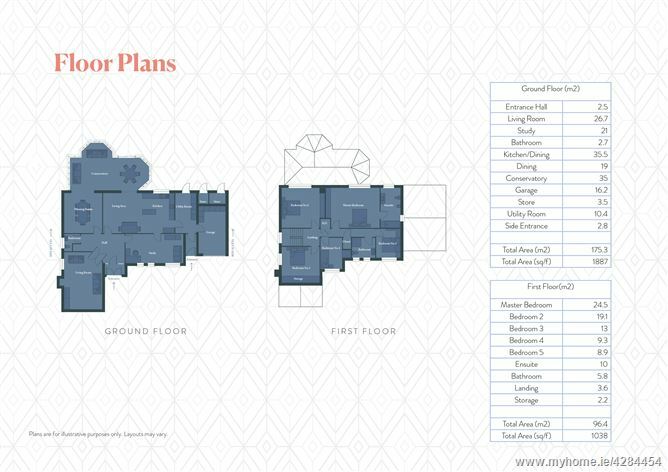 Stairs and First Floor Landing Carpet to floor, wood balustrade, window to right on return, attic access. 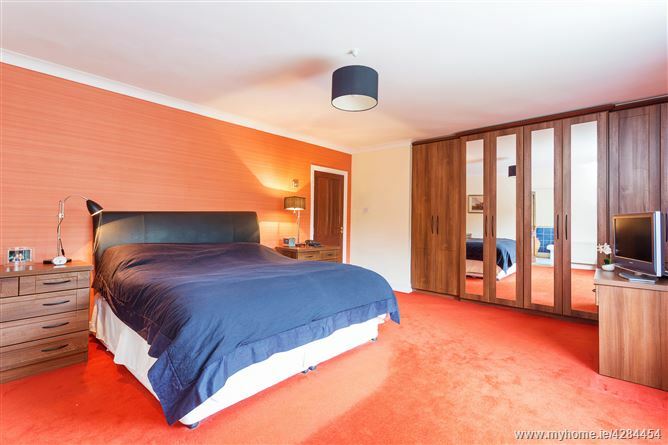 Master Bedroom Eight doors of recessed wardrobe space to left with four mirrored doors, large window to rear overlooking garden, carpet to floor, pendant lighting. En Suite Tiled floors and walls, wash hand basin, with storage installed beneath and mirrored storage above, window and towel heater to rear. WC and bidet to right, bath to front and bath screen. Bedroom 3 Three full doors of wardrobe space and eight further doors of raised above-bed storage, window to front, carpet to floor. Main Bathroom Window and towel heater to front, tiled floors and walls, recessed wash hand basin with storage beneath and to either side, mirror above and two up lighters to either side. Large corner shower with screen and thermostatic pumped taps. Bedroom 4 Three doors of wardrobe space to rear, window to front, carpet to floor. Bedroom 5 Eight doors of recessed wardrobe space to rear, window to front, carpet to floor.